Worker witnessed numerous gruesome deaths at her job: Comp for mental injury? 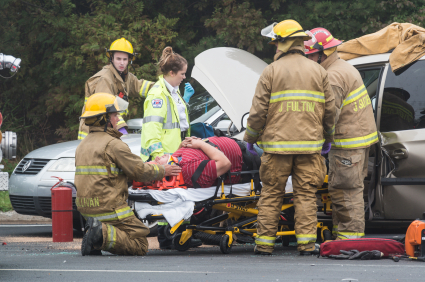 After a 20-year career, a responder to traffic crashes applied for workers’ compensation benefits due to mental injury caused by witnessing horrific car crashes. Her employer denied the claim, saying her experience was no different from other employees doing the same job. How did a court rule? Linda Mantia worked for the Missouri Department of Transportation (MoDOT), providing traffic control and assistance at motor vehicle crash scenes on state highways. Mantia estimates she responded to about 1,000 crashes in 20 years on the job. witnessed a woman commit suicide by jumping off a highway bridge. The Missouri Labor and Industrial Relations Commission awarded Mantia comp benefits for 50% partial permanent disability and the right to future medical care from MoDOT for her work-related mental injury. MoDOT appealed. Medical experts for Mantia and the company agreed she suffered from depression caused by her experiences at MoDOT. The company’s expert set her disability rating at 2.5%. Mantia’s doctor categorized her depression as “major,” and set her disability rating between 90% and 95%. The two sides also disagreed on how Missouri’s workers’ comp law should be applied to the case. MoDOT argued Mantia didn’t prove the injury was extraordinary and unusual because other employees doing the same job had similar experiences. However, Mantia argued that, due to a change to Missouri’s workers’ comp law in 2005, it was no longer necessary to prove a mental injury was extraordinary and unusual compared to other employees doing the same work to qualify for benefits. The 2005 amendments require a strict reading of the state’s workers’ comp law. Interpretations by Missouri courts of parts of the law that were ambiguous were set aside. The part about comparing situations to “similarly situated employees” isn’t in the original law. It was part of a court interpretation that was used up to the law’s revision in 2005. Given that, the appeals court said that strictly reading the section of the comp law regarding mental injuries, a strict reading of the law only requires that the work stress be extraordinary and unusual. The court said that was enough to consider Mantia’s work stress to be extraordinary and unusual. MoDOT argued Mantia’s work stress can’t be considered extraordinary and unusual because other MoDOT employees performing the same job had similar experiences. But the court said, after the legislature’s rewrite of the comp law in 2005, the comparison to other employees no longer applied. The appeals court affirmed the Commission’s ruling that awarded Mantia comp benefits for 50% partial permanent disability and the right to future medical care from MoDOT for her work-related mental injury. In an attempt to make the state’s workers’ comp law more business friendly, the Missouri legislature made the section of the law about mental injury easier for employees to prove – at least if this court decision holds up against any future appeal.